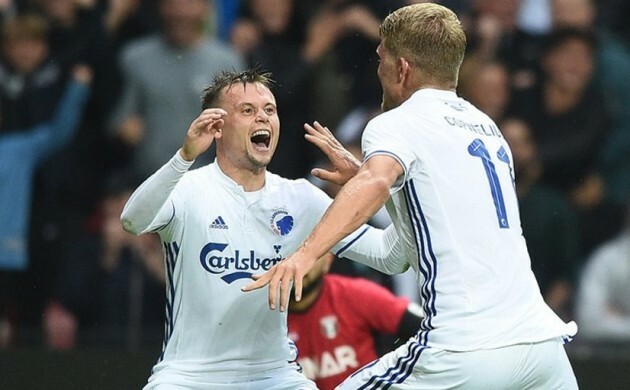 FC Copenhagen took a big step towards reaching the Champions League group stage with a 3-0 home triumph against Romanian champions Astra Giurgiu last night at Parken. After securing a 1-1 draw in the first game last week in Romania, the Danes dominated in the first half and led 3-0 at the break thanks to a brace by Andreas Cornelius and a powerful finish by Federico Santander. The second half was unsurprisingly a formality. “The first half was the best display since the 2010-11 season,” said Ståle Solbakken, the FCK coach. The 4-1 aggregate win guarantees FCK a spot in the Europa League group stage at the minimum and a decent chance to qualify for the holy grail of international club football, the Champions League. The reigning Danish Superliga title holders have one more hurdle remaining and it will come against the champions of another European league, thus avoiding the sides that have qualified thanks to high finishing positions in the bigger leagues such as Manchester City, FC Porto and AS Roma. Their opponents will be either APOEL Nicosia (Cyprus), Red Bull Salzburg (Austria), Viktoria Plzen (Czech Republic), Celtic (Scotland) or Legia Warszawa (Poland). The draw for the final play-off match-ups will be on Friday.